So last time, I started to write about fencing. Today, I’m going to expand upon that with the first of several discussions about equipment. This time, I’m going to cover the protective equipment. Your characters in a fantasy story may wear various types of armor, depending upon what weapons they are likely to face, their socioeconomic status, or their own strengths and training. However, if they’re doing anything related to modern sport fencing, I hope I can provide some useful information about the equipment – its idiosyncrasies, odor, and wear and tear. While injuries can be incurred in fencing, most of the time they involve the joints and muscles. Minor scrapes and bruises are also very common. Stab wounds are not so common. But this is because there are strict rules about the gear that is worn and the durability of the weapons. While it is rare, sometimes fencers do get stabbed. I know several fencers that have had a blade go through their hands or into their arms. The most well-known death of a fencer in modern times was that of foilist Vladimir Smirnov in the 1982 World Championships. As a result, stronger safety rules for equipment were enforced. This is one of my lamés. I had a blade go through the shoulder. The lame material is not intended to stop a blade, but this type is particularly thin and breathable. The red arrows are where the blade went in and out. I sewed the holes up so they are a bit tough to see. 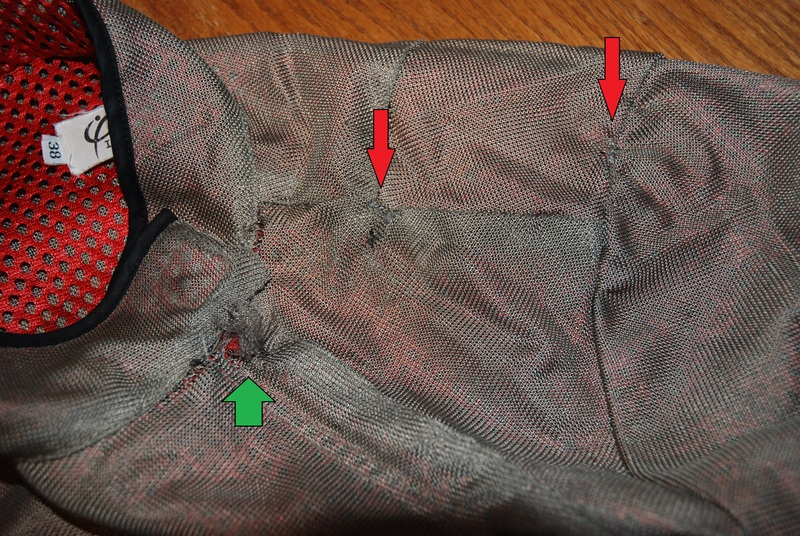 The green arrow is where the thin fabric is ripping at a point of stress. The basic pieces of a fencing uniform are the jacket, plastron (underarm protector), chest protector (for women), knickers, mask, glove (one), shoes, and socks that overlap with the knickers. For electric scoring, there may also be a lamé, overglove, an electric mask, body cord, or mask cord. What nearly all of this equipment has in common is that it is made of fabric that will absorb sweat. I believe that most fencers do not wash their equipment after every practice. The wash instructions on my jacket specify that it should not go into the dryer. That just makes it extra annoying to have ready for the next practice. The conductive material on the electric mask, lamé, and overglove must maintain a minimum level of conductivity. At most tournaments, there is a “weapons check” area. The conductive pieces are examined to make sure that they will conduct enough electricity to register a touch. 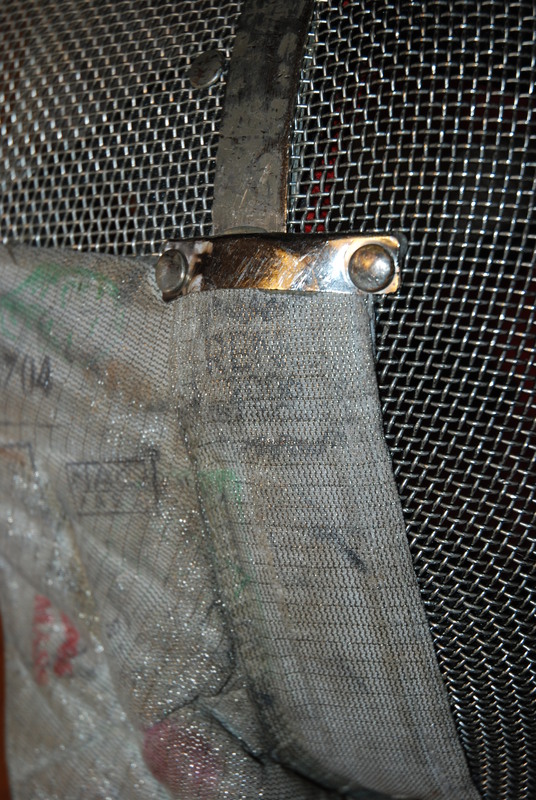 This fabric is a mesh of metal wires which can break with rough handling (like washing). Cleaning is restricted to a soak in water or a water-ammonia mixture. There are some masks that have removable padding which can be washed. But still – there is an odor of sweat that can be especially ripe when the equipment is bundled into a bag, thrown into the trunk of a car, and left there in warm weather. I keep my sweaty equipment in a separate bag. It gets hung up to dry and air out between practices. It does get washed once when the other laundry in the house gets washed. Also, if you leave your sweaty fencing whites in the same compartment of the same bag that contains the weapons, the blades will rust and the rust will leave long red-brown stains or splotches on the whites. It can look like blood. But if you’re a fencer, you’ll know that it’s just rust. As far as the different weapons go, they all use different electric scoring equipment. The underlying whites are the same (jacket, plastron, +/- chest protector, knickers, shoes and socks). Epee is the simplest – no additional layers of equipment are added. 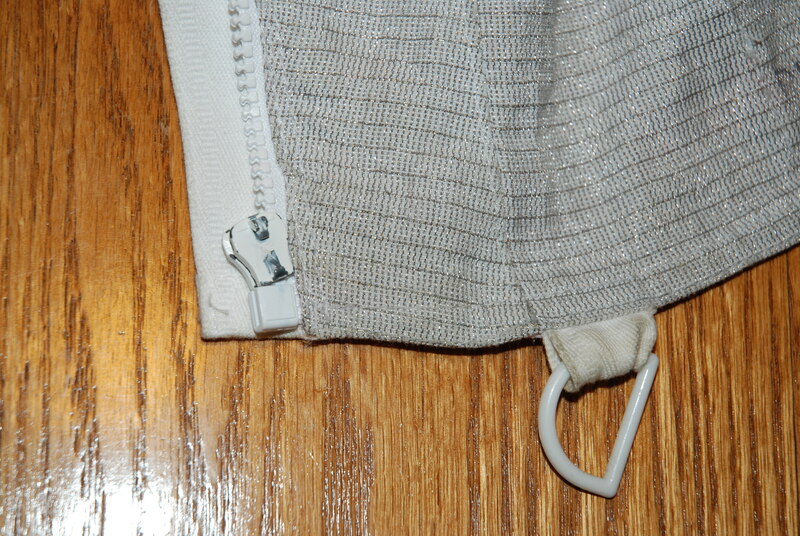 Epee fencers only use a body cord that runs beneath the jacket. Foil fencers have a body cord and a lamé that covers the torso. Either a plain mask with no added conductive material OR an electric mask with a partially conductive bib are used in foil. Which mask rules are valid will depend on whether you are fencing domestically, internationally, or in a qualifying event for international competition. My current sabre glove/overglove combination. The marks on the back of the hand are from weapons check. Sabre fencers use a body cord, a lamé that covers the torso from the waist up (including both arms), an overglove, a fully conductive mask, and a mask cord. The purpose of the overglove makes more sense when you look at the order that the pieces are worn. The lamé is worn over the basic fencing whites and the glove is pulled on over the forearm of the lamé. By doing this, the glove blocks the conductive target area of the forearm. The overglove is a thin piece of lamé material that is pulled on over the glove. I prefer to use a glove that has the overglove built in. Stamps on the back of my lamé. The electric scoring equipment is marked with a tag or stamp after the weapons check. 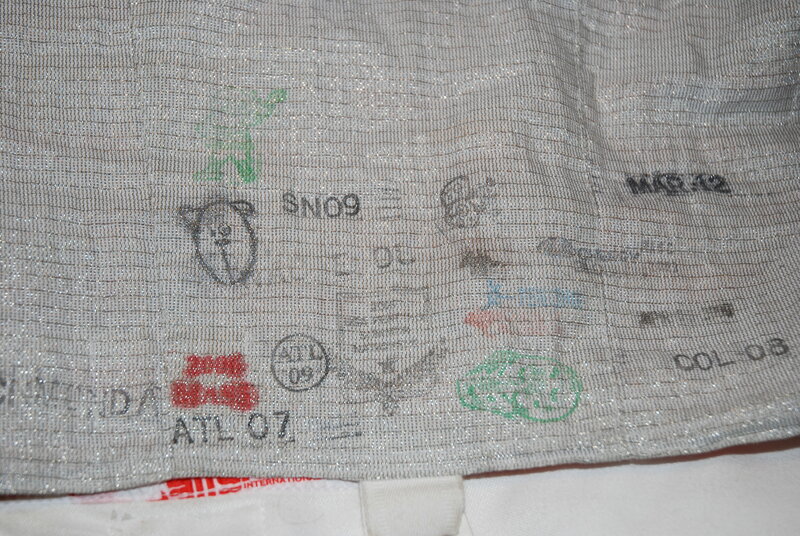 Many fencers will have a collection of stamps on the lower back of the lamé, the back of the hand on the overglove, and the side of the mask. At tournaments, the masks also must pass a punch test to evaluate the integrity of the metal mesh. If you ever doubt your mask’s strength, whether or not it passes the punch test, replace it. The attachment points for the bib at the sides of the mask can also weaken. If there is any chance that a blade can slide through this area, do not use that mask. Stamps on the side of an older electric sabre mask. This is where much of the wear and tear happens on a mask. Fencing equipment also contains a lot of velcro. 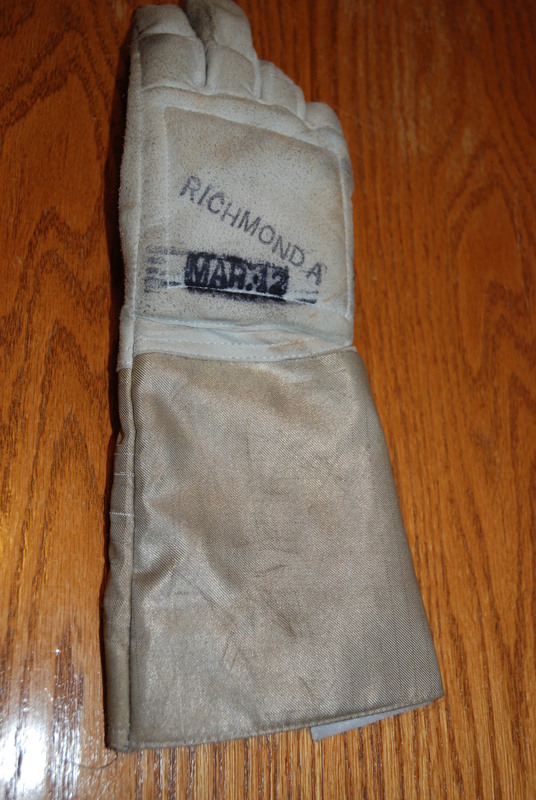 However, the velcro wears out before the rest of the material, except for on my gloves. There is a small patch of velcro on the neck of the jacket and lamé, and on the waist of the knickers. I have also had zippers consistently break on the lamés and jackets. Sometimes the D-rings on the jackets and lamés rip off. 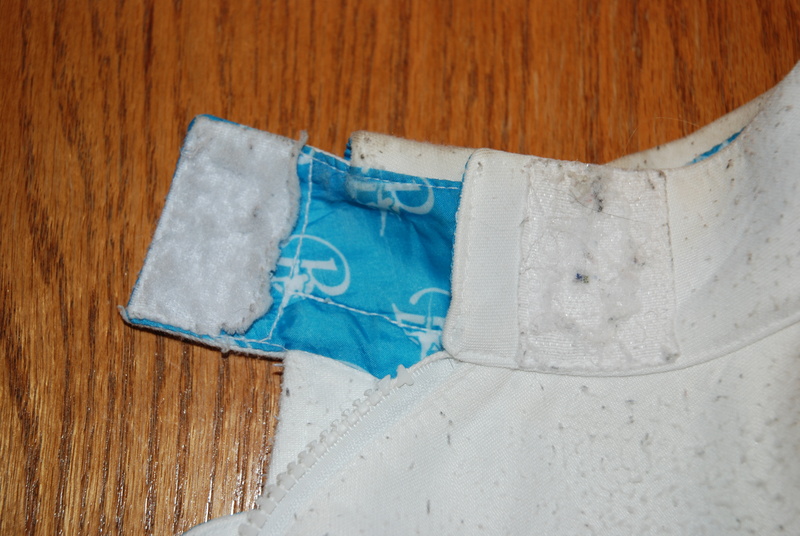 Straps on the chest protectors, plastrons, or knickers lose their elasticity over the course of many years. My original chest protector had the longest lifespan of all my equipment, lasting about twelve years before I gave in and replaced it. The metal hooks (like a bra closure) rusted and all fell off. Sometimes children or men wear a flat chest protector (more common in epee). This is the velcro at the collar on my jacket. It no longer sticks at all. Additional wear points are the fingers and palm of the glove. I have worn holes in countless gloves. They can be temporarily repaired with duct tape, but you’re probably better off just buying a new one. Socks are socks. The toes and heels wear out. I’ve seen foil and epee fencers get holes in the shin portion of the socks from taking hits there. How your shoes wear is probably more of an individual thing based on whether you drag your hind foot when you lunge, the frequency of training, the surface of the gym or strips, and the shoes themselves. This is the bottom edge of my lame. The tab has broken off of the zipper, so I have to pull it up with my fingertips. This has happened to me on three separate pieces of equipment of different brands. You may have noticed that there is only one glove. The non-weapon hand is unprotected. It is supposed to remain by the hip or back, out of the typical area where attacks land. Most new fencers will instinctively bring this hand up when they are hit and it will get struck frequently. Even when it is held properly out of the way, it can be hit by a particularly fierce or wild attack. I’m sure there are plenty of things that I haven’t covered here. Just remember, it’s all fun and games until someone loses an eye. Leave me any questions in the comments and I’ll do my best to answer them. Next time – weapons (with a necessary emphasis on sabre, since that’s what I know best). One of the activities that I participate in regularly is fencing. Since a lot of fantasy literature is either set in a pseudo-medieval setting, or at least involves some swords, I thought that I would write a series of short articles on modern fencing, and how that can be applied to crafting those fight scenes. 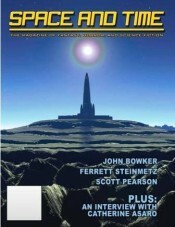 This first article is just going to cover the basics – the different weapons, rules, and a little about the equipment. I don’t intend this to apply to all different weapons and styles of sword-fighting, just what my fencing has taught me. I’ll have articles on strategy, mind-set, competition, and injuries. There isn’t a lot in this article about how to apply this to fiction, but I think this will outline the basics so that the later posts will be easier to understand. So to start with, there are three weapons in modern fencing: foil, epee, and sabre. Most of the time, an athlete will train and compete in only one of those. There is some crossover, but each weapon requires different equipment and has its own style. Some fencing clubs focus on one weapon more than the others, but any large enough club will have all three. When I started fencing (almost 18 years ago), I began with foil because the members in that club fenced foil. The equipment also dictated this to some extent. The scoring boxes (more on these later) were expensive and many at that time did not allow for sabre. This was also a college club, so there was a limited budget to purchase equipment. In some traditional schools of thought on training, foil is always taught first. Once a fencer develops the basic footwork and coordination, then the fencer can transition to a different weapon. This isn’t always the case, and I think it is becoming even less common now. Once sabre equipment and training became available to me, I switched – I think sabre is just more fun. Foil is a point weapon. If you hit your opponent with the flat of the blade, it will not count. If you hit your opponent with the point, then it might count. The target area for foil is the torso, not including the arms, and maybe including the bib on the mask (the rules keep changing on this). There is a nice illustration of the target area from wikipedia here. If you hit your opponent off-target, it will not count. If you hit the target and your opponent does not hit you, then you get the point. 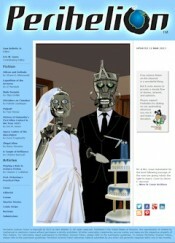 If you both hit on-target, then there are more detailed rules about “right-of-way” which determine who scores a point. The referee will decide this. Here is an example of a foil bout from the 2011 World Championships. The bout starts about 2:20 into the video. Each weapon looks a little different. This is a foil. Epee is also a point weapon. The difference between foil and epee is in the target area and the rules that follow from that. The epee target area is the entire body. If you hit anything, it counts! There is also no “right-of-way” for epee. Whoever hits first scores the point. If both fencers hit within a certain small time period, then both fencers score a point. Here is an example of an epee bout from the 2011 World Championships. The bout starts about 1:15 into the video. This is an epee. The guard on the epee is larger because your hand is part of the target. The blade on an epee is also heavier and stiffer than the foil. Sabre is a cutting weapon. This means that you can hit your opponent with the point or the flat of the blade. The target area is from the waist on up. The entire head counts, as well as both arms. The hands do not count. Wikipedia again has a helpful illustration here. Having the option to hit with the flat of the blade makes it much easier to hit your opponent in sabre, so the style of sabre fencing is generally faster and more aggressive than the other weapons. Sabre has a “right-of-way” rule like foil, so when both fencers hit, the referee makes the call on how to award a point. Here is an example of a saber bout from the 2011 World Championships. The bout starts about 1:25 into the video. Here is a sabre photo. The fencing sabre resembles a cavalry sabre, with the curved guard to help protect the fingers and to make it possible to parry (block) an opponent’s slashing attack. Well, I think that’s enough for this post. 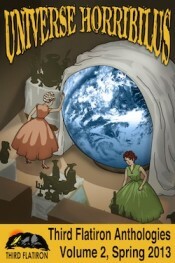 Look for the next one in 2 weeks. Everything you ever wanted to know about the practical side of fencing equipment – what will wear out and fail, how blades break, and what is that smell?